The legal relationship of guardianship constitutes a legal tool to ensure the guidance, personal decisions, and care for minors without adequate parental care or disabled adults with severe disabilities. Guardianship refers to the appointment of a party to manage the medical care, financial issues, and living situation for minors without a current parent or guardian or an incapacitated adult. The individual over whom the court establishes a guardianship is referred to as the “ward.” A guardian must perform certain duties established as part of the guardianship related to the support, protection, and care of the minor or disabled adult. Whether you are a party seeking to establish a guardianship or to deal with other guardianship issues, our Mesa guardianship attorneys can analyze your circumstances to confirm that a guardianship would provide the best option, file your petition for guardianship, represent you in court, handle ligation (e.g., disputes over the choice of guardian) and prepare accountings if required by the court. Our lawyers at Tait & Hall Law Firm have handled thousands of civil and criminal cases in Mesa and the surrounding areas of Maricopa County. When we represent a party seeking a guardianship, we guide our clients through the process by preparing and filing all court documents and appearing to serve as an advocate in court. Because we have handled many guardianship matters, our attorneys understand the relevant grounds for granting a guardianship and the evidence that will be important if the guardianship proceedings are contested. We focus on making the process as smooth and stress free as possible while keeping clients informed of the status of their case. Arizona law recognizes two types of guardianships: (1) Title 8 Guardianships and (2) Title 14 Guardianships. Title 14 Guardianship: The task of obtaining this type of guardianship presents more of a challenge because the consent of both parents does not have to be obtained. Even if a parent or both parents oppose the guardianship, the court can approve a guardianship if the protection of the child’s best interests justifies removing the minor child from the biological or adoptive parent(s). A Title 14 guardianship over a child will continue until the minor turns 18 or the court issues an order terminating the guardianship. If a parent objects to the guardianship, evidence and testimony will have to be presented to establish the need for a guardianship and/or to defend the petitioner’s choice of guardian. Because this form of guardianship must be based on parental consent, it can be terminated if either parent revokes that consent. Adult guardianships can be established for several reasons, such as incapacity of a parent or grandparent. If an adult has mental health issues, these issues also can be the basis for establishing a guardianship. Our guardianship attorneys can prepare your petition for guardianship, compile an investigator and/or doctor’s report, and represent you at the court hearing. Our attorneys represent stepparents, grandparents, and other family members whether the case proceeds through mediation or litigation in the courtroom. We can analyze the unique circumstances of your situation to advise you regarding your rights and prospects in pursuing a guardianship especially when a parent opposes the request. Our guardianship lawyers in Mesa have the expertise and experience to prepare your application, keep you informed throughout the process, and persuasively advocate for your interests in court or mediation. 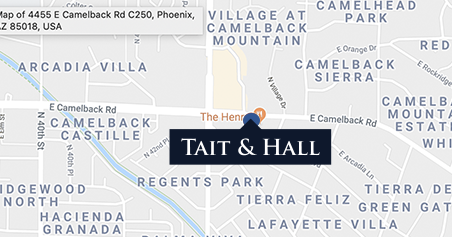 Our attorneys at Tait & Hall Law Firm strive to provide exemplary legal services in Mesa and the surrounding areas of Arizona. If you have questions about guardianships, we invite you to contact us at (480) 405-6767 or send an email.